SYMBOLIZATION: We give names or other symbols to the classifications. We name people “Jews” or “Gypsies”, or distinguish them by colors or dress; and apply the symbols to members of groups. Classification and symbolization are universally human and do not necessarily result in genocide unless they lead to the next stage, dehumanization. When combined with hatred, symbols may be forced upon unwilling members of pariah groups: the yellow star for Jews under Nazi rule, the blue scarf for people from the Eastern Zone in Khmer Rouge Cambodia. To combat symbolization, hate symbols can be legally forbidden (swastikas) as can hate speech. Group marking like gang clothing or tribal scarring can be outlawed, as well. The problem is that legal limitations will fail if unsupported by popular cultural enforcement. Though Hutu and Tutsi were forbidden words in Burundi until the 1980’s, code-words replaced them. If widely supported, however, denial of symbolization can be powerful, as it was in Bulgaria, where the government refused to supply enough yellow badges and at least eighty percent of Jews did not wear them, depriving the yellow star of its significance as a Nazi symbol for Jews. This was a good day - our relationship with the students grew stronger and we had a big push on the work too. For the first time it felt that the students had settled us into their regime, their guardedness (and the reserve of their teachers) was coming down and they took risks with the pieces because they'd begun to trust us. The atmosphere was clear and focussed in comparison to the previous day, though there were still tail-ends of tantrums at breakfast. In this school, it is a priority to establish a safe environment, otherwise the young people are so brittle they can’t relax enough to give their best. We worked them very hard, requiring levels of attention that I don’t think some of them realised they possessed. They unpeeled layers of protection, starting to show their vulnerabilities and allow themselves into the pieces. Little revelations came moment to moment. Suddenly we were rewarded with painstaking effort and personal expression, the excitement of making something that is true. There were many notable incidents on this good-style day. 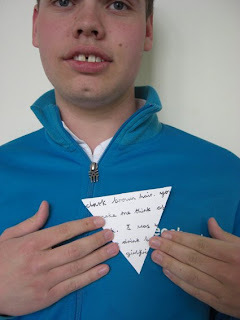 One of my favourites was the opportunity to work with J – who has a diagnosis of autism, attention deficit syndrome, depression and anger management issues - and is embarrassed about his handwriting on top of all that. With constant supervision and cajoling he wrote a deeply felt piece explaining his difficulty with words, with expression, with people and with himself. During the writing, he actually fought with himself to try to stop his own self-interruptions and allow clear thinking. It was a small piece of paper containing a large personal victory for him. Another piece, read out by A, described the fits that he suffers from and how they pursue him through his life, wrecking days and leaving him shaken, agitated. This was a heartbreaking piece of prose, read despite a stutter, but with great intensity. I actually had tears in my eyes, witnessing this desperately forlorn little autobiography. Everytime the word ‘fit’ came up – and it was mentioned many times – it hammered the point deeper in. During all of this there were visits from the headmaster, school governors, the music teacher, art teacher, and a string of other adults. Although we were preoccupied, it was a wonderful set of interruptions – it was as though we were receiving blessings. In the late afternoon we were getting close to exhausted and were grateful for a final session with the beautifically calm art teacher who generated such tranquillity that we all let go of our various tensions and made pieces in happy suspension. Going home seemed terribly sad. Day three at Delamere Forest started with some confusion – a policeman had come into the school to give a talk on bullying and so the first session was cut to two people. The resulting pieces were interesting but something of a diversion, and a little distracted. Y wanted to pursue his longer poetic ideas – and brought with him a mix of great dynamism, a restless intelligence and compulsive need for attention. He is sharp, insightful and full of the desire to create - either art, or chaos - fortunately for us, he voted for art. It felt like he was not only making art with us, but also making a role, constructing himself as a possible artist. K meanwhile launched into making nine word, three line forms which were caged in a grid. This was a neat little idea, which we are appraising and have put to one side for later consideration. K then started on writing the headings of the eight holocaust stages. Throughout our time he poured his effort into making badges with us; I was later told that his attentiveness was unusual and a big compliment. The next session was interrupted by an argument between two pupils, one teasing the other – a poisonous little spat which wrecked the creativity of one person and soured the atmosphere. The main breakthrough of the day came with the next set of poets who worked on love poems. They struggled against embarrassment, sarcasm, the urge to cover their vulnerability and a basic fight with the inadequacy of words themselves. 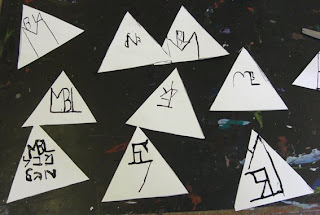 The results were extremely moving and worked fabulously when cut into triangles and worn as badges – they were coy messages, given an edge by the context they’d been put into. The afternoon sessions were low key and relaxed but did not really produce any great shifts in the project. Unfortunately, the last session ended in tears because I inadvertently cutup someone’s artwork – clumsy and done because of rushing the end of the day – it was a sad little postscript. The school is a crucible for intense feelings to cook to temper level. It is several times over sealed away from the outside – it is in a secluded place, many occupants live there for most of the year, the pupils are categorised as having ‘special needs’, the school is accentedly Jewish and therefore apart from the educational mainstream. Finally, the students are suffering the delights, diversions and horror of being hormone-ridden teenagers. All of these things gather together and multiply each other effect. We arrived into the midst of this as artists with the deliberate intent to stir things up – and we became a catalyst. Interpersonally, the pupils are often very kind to each other, and are strongly guided toward supporting one another. But the very nature of their issues force a clash against each other’s needs. Someone who has a racing mind and a short attention will conflict with someone else whose thought processes and comprehension are much slower. But some of the less hyper young people can deal with change better than their faster companions who cannot cope with new faces and possibilities. We were tired by the intensity of the atmosphere at the school – and had brought some of our own worries along too. A pair of pretty battered arthur+martha artists had our tea with the school, bid our farewells and slipped off to the B+B for well-earned walks in the country and a kip. Our second day began promisingly with an excellent session that grew out of a discussion about the holocaust. The students were the oldest group we’d met and they were well-informed and impassioned about the subject. They inspected yesterday’s work and decided that it wasn’t communicating the message clearly enough. I suggested that they try making some pieces that they felt would bring some teeth to it all and they set to. After initial misgivings and rebellions they settled into making a powerful sequence of works that were striking, subtle too. Blending numbers and the iconography of the concentration camps, they came up with a set of works that had great clarity. Two of the standout pieces used a grid of barbed wire for a template and morphed the barbs into numbers. 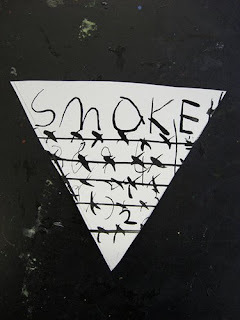 One of them simply had the word ‘smoke’ overwritten onto the design. This particular artist was S, who had become interested in the holocaust because one of his relatives was a camp survivor. Through them he had met other survivors and so the history for him was very alive. His badge became a talking point for many of the teachers who dropped in. Next we worked out in the playground and the students drew chalk triangles into which they wrote their names as number sequences. It was energising to get outside and the group loved being able to transgress by ‘vandalising’ the ground. In particular, H adored the naughtiness of it. When we came back into the classroom she was fairly dancing with glee and filled with energy. It is very easy in this environment to pick up the convenient diagnostic labels (ADS, autism, etc) that are provided for us and use them as though they were signifiers of character or identity. How gruesomely ironic it would be to embark on this project - also about the labelling of people - and slip into those habits. And yet how easily names stick, and what useful weapons. At a recreation session one of the kids used the word 'Downs' as a putdown for a fellow student. He was instantly reprimanded, but the sting of it stayed in the air. Part of the reason of course was so that the insulter would distance himself from his fellows and the shame of being labelled 'special'. In the afternoon we tried some collaging, and some charcoal work, which looked appealing but again strayed from the main thrust of the collection. As Lois said, it's like it needs glue. Perhaps we will find it tomorrow? The recent international Text Festival based here in the UK brought together poets and artists from all over the globe. Since the 1970s, the more experimental, eccentric, individual British poets have been nudged into obscurity. The Textfest is the first platform in decades that the avant garde has had for prolonged, largescale public gatherings in the UK. As such, this was a celebration, launched by the remarkable Tony Trehy and headlined by Ron Silliman, one of the great living poets in the world. The 2009 festival was a whirl of interesting/interested folk, beguiling works and an exhibition curated by Trehy that trounced the boundaries between poetry and text art. Artists like Patrick Pannetta, Ben Gwilliam, Liz Collini re-make the possibilities of the word and therefore of poetry. The performances also mix-matched film, storytelling, performance art, soundworks. 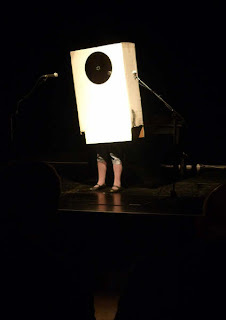 Hester Reeve dressed up in a box and read out the names of the audience as a prelude to Ron Silliman. The wonderfully engaging American poet Geof Huth was a-dance with invention during his reading, backgrounded by a huge vinyl repro of one of his own visual poems. Canadian Tom Konvye presented a night of poetry film. The readings were indelible. Tony Lopez was almost unbearably moving - in a crumpled white suit and an ordinary man voice, he catalogued horrors and mundanities - and yet at the same time seemed to be a force for gentleness and hope ('Without struggle there is no identity.') Carol Watts was as ever deft with her grace and her intelligence. Ron Silliman, despite the razzmatazz, shared generously of his insights - and gave one of the best poetry readings I've heard. It was a remarkable gathering of intelligent people, but the most abundant qualities were cameraderie and emotional warmth. Strangely, in the midst, my own anger surfaced that so many - so much beauty - could be ignored and relegated to marginalia. The mainstream refuses to attend to the weird edges - but it is at the edges that we discover the new, the things we didn't know about ourselves. Writing this reminds me of the older people who Lois and I encounter as 'arthur+martha' (how many times I've been called Arthur). They too are at the margins and they too have much to tell of those wild edges. In a discussion during the opening weekend, Tony Lopez stressed the importance of not just making our own work, but engaging with other people's. Attention is a gift. But - like a stormwarning - the phrase from his reading comes rolling back: without struggle there is no identity. I can still hear his remembered voice now, drawling as I type. 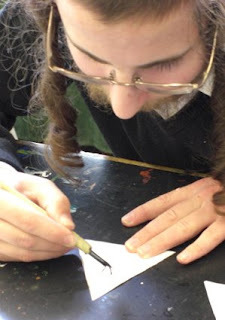 This is written in the evening of the first day of our residency at Delamere Forest School, which is a school for (mostly) Jewish students with special needs. A first day of trial-and-error experiments. Our idea was to use the ‘eight stages of genocide’ identified by the Genocide Watch organisation as a framework for our work. We would play with visual poetry ideas engaging with each stage of the eight and make work that examined or contradicted each stage. 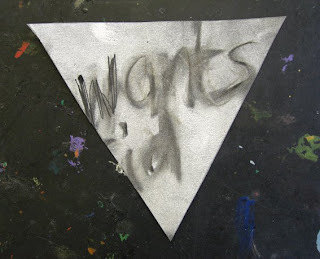 The poems would be in the shape of triangles, recollecting the triangle badges worn by concentration camp prisoners during the nazi regime. But in contrast to the purpose of the original ‘Winkel’ badges, we would make pieces about the unity between people, the things that bring us together rather than divide us and also celebrate the quirks of individuals. That was the theory. However we decided not to directly talk about the holocaust on the first day of sessions – didn’t want to launch into that dark place too quickly and without knowing our companions - so on this day we mentioned our main subject only by implication. Nevertheless, the students piled in with great gusto, making pieces full of vigour and humour. 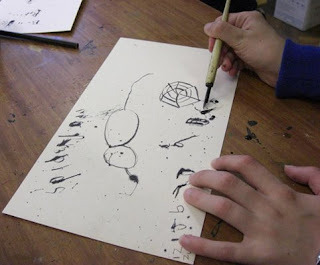 We were working with dip pens and it was a pleasure to see the wide variety of expression in the marks, the discovery of new modes of communicating. Just as the pieces of art assumed character, so the characters of the students began to shine through and we began to make friends. In fact, meeting people was the biggest part of the day. The triangle badges became more accomplished through the day as our focus sharpened and we began to fine-tune ideas. The art in making group pieces like this is in finding the rules of play. The makers’ work should be complemented by the process given to them. The balancing act we are trying to pull off is complex. Eyebright needs to be simple enough for many people of widely differing abilities to join into. At the same time it needs to reflect upon an extremely traumatic and knotted area of modern history. By allowing both complex and much more physical and raw work – and by allowing in people whose vulnerabilities become another layer of saying – we hope to make a delicate, elliptical piece. 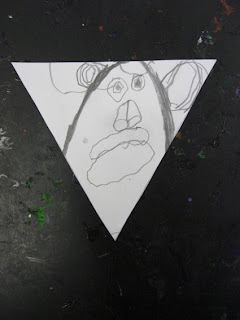 The result of the first day: thirty or so triangle badges which are full of wit, personality, cheekiness, resistance, petulance, fun, consideration – in some tiny way antidotes to the original triangles and their terror. This project has been made possible by the generous funding by Sparks: The Clore Jewish Development Fund. "what the hell's happened to me? 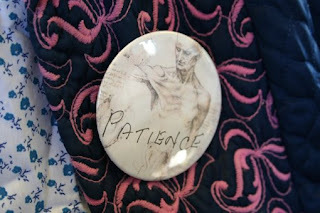 that rush towards the remember..."
Lottery funding through 'Awards for All' has just been confirmed for the new arthur+martha project PATIENCE, an insider’s guide to illness using poetry and art. Patients can share experiences of living with ill health. For staff, it will be a chance to pass on their insights into caring for others - and the emotional cost. We would like to invite submssions to blog address http://patience-project.blogspot.com/ as part of gathering insider accounts of illness. If you, or anyone you know, would like to send material to the blog, we would be delighted to receive it. Please circulate this information to anyone you think might be interested. The PATIENCE collection will particularly focus on the experiences of older people. It will be published as a set of pamphlets and a book and also documented online. Art is capable of depicting the impossible or invisible: hope, pain, joy, fear… states and emotions sometimes inescapable with ill health. We will explore some of our most powerful and yet most elusive moments - times of survival. Paracetamol Soup, the recent arthur+martha exhibition of work made in healthcare settings, was reviewed in The Guardian (article by Penny Anderson and photostream at http://www.guardian.co.uk/society/2009/apr/29/arthur-martha-artists ). The Big Issue will include a feature about arthur+martha and PATIENCE on May 25th. Our exhibition 'Paracetamol Soup' is about to finish its run at Central Library, Manchester. We've been really pleased with the reactions its received, and local press coverage and national with The Guardian newspaper. I've just been sent a collection of photos of the exhibition, which I have posted up on our flickr site. You can view at http://www.flickr.com/photos/arthur-and-martha/ for more photos of the collection, click on the Paracetamol Soup set.